If your pets' cage is split over several levels, they will need some way of getting up and down between them. Ramps are the best thing for the job, although there are alternatives if you don't have much space. You can also use guinea pig ramps to allow your cavies to get in and out of their cage, and to add interest to a run or playpen. Guinea pigs are most comfortable walking on solid, flat surfaces, so a ramp is the best thing to use if you need to give your animals something to walk up and down. Try to keep the angle as shallow as possible by getting a ramp of a good length - if it is too short and too steep, your pets will have difficulty getting up and down it, and may avoid using it completely. 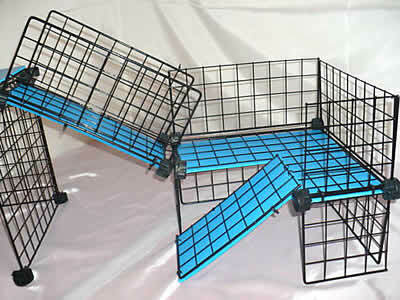 Provide ramps for your pets to move between different cage levels. This one doubles back on itself to save space. Many pet stores sell ramps which are made from solid wood. These are ok, but can be a little uncomfortable on your guinea pigs' feet, and you might also find that they can't get enough grip to walk up it properly. You can fix both of these problems by covering the ramp with a soft, grippy material such as carpet, towelling, or rubber. If your guinea pigs' cage doesn't have much room for a ramp, you can buy or make one which doubles back on itself. This gives the benefits of a shallow angle without taking up lots of space. These are particularly common in hutches which have a built-in guinea pig run underneath. When buying or making a guinea pig ramp, make sure it has plenty of width. This will make your cavies feel safer and more confident when using it. If your pets have a steep angle to climb, or if you are very pushed for space, you can use stairs rather than a ramp. Guinea pigs are actually quite comfortable using them, and can get up some surprisingly large heights - they can even be taught to climb the stairs in your home! 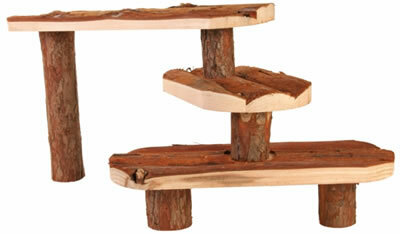 When buying them, make sure that each step is large enough for them to sit comfortably before tackling the next one. Stairs are a good alternative if you haven't got space for a ramp. Guinea pigs have very delicate, sensitive feet which makes it painful for them to walk on wire mesh ladders, so they should be avoided. They also tend to be far too steep for your cavies to climb, so you will find they won't use them anyway.